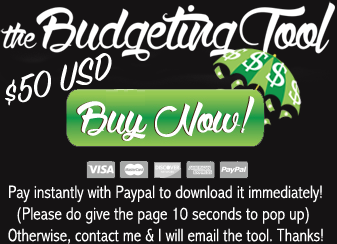 August 2014 Budget Roundup = $227,956.49 or a decrease of $4837.75 or -2.08% | Save. Spend. Splurge. I am on Season 3 right now. My favourite episode by far is Episode 4 of Season 3, near the end where Danerys trades a dragon for the Unsullied army and then turns around to give it all to them. I keep watching it over and over again. Emilia Clarke is a FANTASTIC actress.. and Danerys is obviously my favourite character. .. So Asian Pear (congratulate her on reaching the $100K mark!) shared this video of Emily Blunt on her new baby (Hazel), and the first part where she had an interaction with Nurse Mabel, is exactly what happened to me. OK, so when I had Baby Bun and was recovering, the pediatrician came in to check on him and make sure he wasn’t jaundiced and growing well. Him: Wow. Your newborn baby is really really cute. Me: Oh thank you. But every baby is cute, I’m sure. Him: Nope. No they’re not. Not all newborns are cute. They’re pretty ugly. Yours is cute, and I don’t say that to everyone. Honestly, Baby Bun really is cute. I’d say if he wasn’t because I’m pretty honest about these things. I was ready for him to come out looking like some wrinkled baby monkey and he was a little wrinkly but he had a full head of hair and was very cute. The thing is that looks aren’t everything. I’d rather him be hard working, funny with a great personality, smart, kind and generous than simply good-looking, so that’s why I am not too hung up on whether he is cute or not but I’ll take the compliments when I hear them. Quite honestly, I can make this at home on my own with some frozen puff pastry. This nori vegan wrap on the other hand, was to die for. OMG. Aux Vivres for the win! I will of course, attempt to replicate this as well. It had julienned carrots, beets, quinoa instead of rice (nutty and delicious!! ), sprouts and red cabbage in a roll with some tempeh for the “chicken”.. although you could have put tofu in there and it would have still been delicious. The sauce was “dragon sauce” and it’s sunflower oil, nutritional yeast, sea salt, cane sugar and water. SO. SOOOO GOOD. I want to replicate this sauce and pour it on everything. It made the meal so hearty and satisfying. I ate 4 rolls and felt full. I couldn’t believe I preferred a vegan nori roll to a meat pie. Interestingly enough I got a lot of things on sale. Invisalign is a great investment but ..DAMN it is expensive. And eating out I did! So many macarons and pastries… OMG. Can’t wait to start working again. My net worth will not be in the positive until late this year. For the past 12 months it has looked like this. A nice ride up only to plummet this month! Alas!!! In July I got $558.78 and reinvested it. Is a mortgage a form of savings? Should there only be one breadwinner in the family? Do I have to spend $200 per item now? FU liked my post on whether or not a mortgage was savings. PK liked my post on whether or not there should be only one breadwinner as well as my guest post and not giving your kids money, and so did Leslie. Can’t wait to get back to work. I am actually getting excited about ironing my work clothes too. Oh.. the chance to use my brain again. Thank goodness. Aux vivres in Montreal or you can buy it at Bio-Terre! That’s some nice dividend income. What’s your largest holding? 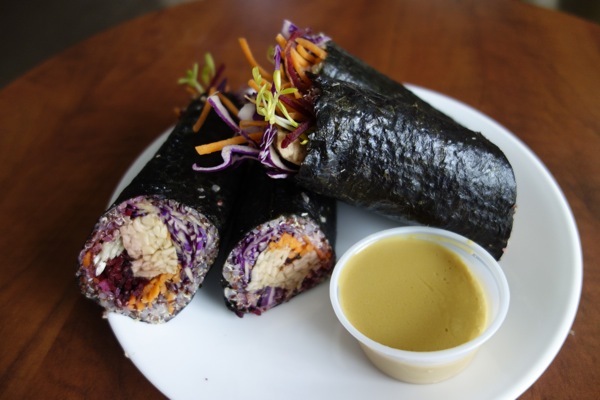 That Nori wrap looks astounding. And I have all the components minus the actual seaweed, so I might have to make that once I pick it up (I’m kind of in love with my julienne/matchstick veggie device). I think I have a crush on Emily Blunt. I watched that entire video and she just cracks me up. I also didn’t realize she was with John Krasinski (I clearly don’t keep up with celebrity gossip stuff). It is SO GOOD. The sauce is what made it though. I didn’t know she was with John either but .. it makes sense 🙂 They’re both funny folks. Woo hoo! You should make the sauce. It’s sunflower oil, water, nutritional yeast, maple syrup and some salt. It was DELICIOUS. Slightly sweet, lots of umami flavour from the yeast. Did you get those pies in Montreal? There’s a pretty good one in Toronto called Kanga but they’re a tad pricey for my liking. That sushi roll does look amazing though. So the sauce is sweet? Tangy? I did! At Ta Pies. As for the sauce it was a bit sweet and a lot of umami. I haven’t watched GOT yet because I know once I start it, I’ll be in a black hole haha! 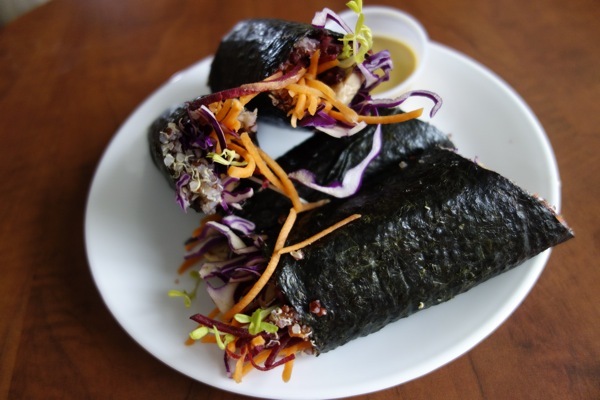 And those nori rolls look amazing!! I hear you on the cost of Invisaline but it’s totally worth the investment. Hope you have a great September, SSS! At least my teeth are straightening. I am pleased so far. 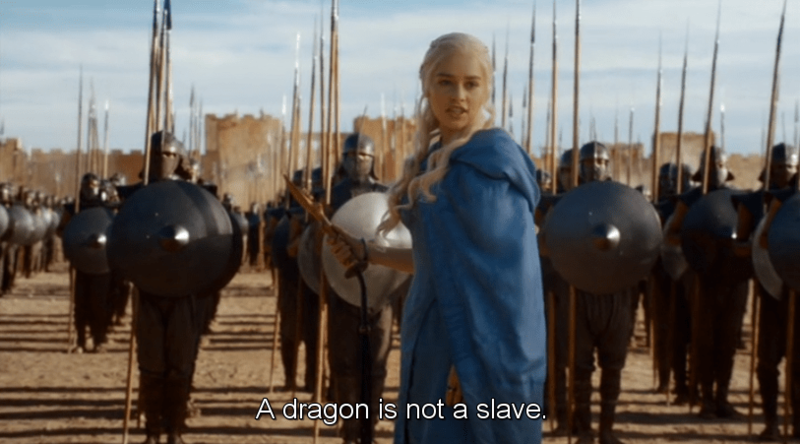 My favourite so far is the end of Season 3, Episode 4 when Danerys frees the Unsullied. Wow, that Australian / New Zealand pies really look yummy! I totally agree that Emily’s new baby is really, really cute. Good to hear that you are going to work again!